Mutant League was awesome to work on! The story of Mutant League wouldn’t be exciting at all if it wasn’t packed to the gills, horns, and ooze with interesting, if somewhat tragic characters. From the show’s hero, Bones Justice, to his arch-nemesis KT Slayer, to the fan favorite Madman and his son, to the rest, this show has all kinds of people, er, mutants, in it. Horns become hairstyles, hands become claws and spiders become a tasty and crunchy snack. You haven’t lived til you had a steaming basket of spider legs with tarter sauce! But the fact that most of the characters no longer fit in the world of normal people, called Norms, doesn’t matter. They’ve become superstars on and off screen. The crew and I worked really hard on bringing these guys and gals to life. As the show's Art Director, my job was to lead the look and feel of the good times you guys got to watch on TV. From characters to uniforms, vehicles, props and backgrounds, we worked very hard to craft something you would love. And the constant flow of emails and comments to the clips on YouTube tells me we were successful. Below you will discover some of the behind-the-scenes sketches, some action figures and even a piece of fiction written by a ravenous fan. Enjoy and thanks so much for loving Mutant League as much as we loved working on it! These toys were based on my uniform and prop designs. Click on each one to see them all zoomed up and what not. I just updated this page with several more packages of the action figures. Wooo! These sketches are of the weight training room for the Monsters team and some of their gear like skates, the goal and the Kidd. Since these guys are way, waaaaay stronger than regular humans, called Norms in the show, I gave the weights and equipment some extra poundage. To make things seem even more dangerous, I made some of the weights triangular to offet the balance. A human would have a hard time with these but to mutants, it's just another day at the office. Now, if anyone in real life steals my triangular wieight designs, I'm bringing the noise to your front door. I've seen a few hockey games and I learned that the fans surely expect a fight to break out. So I made the equipment angry looking to fit the mood. Fun times for all! As I mentioned above, hockey is about slammin' people into the glass but who says you can't also get a little gouging in there? I made the tips of the blades extra sharp so you can play a good game, and still be able to slice through a tomoto. It's two, two, two things in one! One of the toughest, biggest and baddest mutants is Malone. I thought about Clint Eastwood's western movie days when working on Malone's coat. It looks like it's been through hades and back...then again, maybe it has. When the stadium in the show erupts in mutagenic chemicals, it's not only the atheletes who get hit by the goo, as is evident in this sketch. This referee is still as bad with the play calling as he ever was, and he looks the part too! You can find a whole lot more production sketches in the 'Mutant League Sketchbook' which is available on the Amazon Kindle and any tablet that has a Kindle app (which is practically all of them). What Ever Happened to Butch Justice? As suddenly as the quake had begun the ground went still and all was quiet. Football superstar, Butch Justice, was unconscious and caught under broken slabs concrete that had crumbled away from the stadium’s stands. He awoke to find he was exactly where he was before. Hours must have passed because the sky had turned a yellowish orange. Another clue seemed to be that the pungent taste of toxic chemicals didn’t seem to be as fresh in the air. “Hello! ?” he called out as loud as possible, ignoring the aches caused by his activity. No reply. Butch let out a worried sigh that came with another discomfort. Not all his hurt was from having unknown pounds of concrete fall on him. Realization instantly registered as he lifted his free hand. My skin’s gone... How can I still be alive?! It appeared that the bones were far thicker than normal. He rubbed his fingers together to find they could still feel. The touch was firm but with a faint skin-like sensation. God, I hope he’s alright. Bo lost his skin… Malone... Had his…I need to get to them. “We see ‘ya!” the voice replied. It took little time for the pair to reach the skeleton mutant. They too had been affected by what the quake released. One man was brown skinned with large pointed ears, thick brow and an ape-like nose. The other look looked almost normal except for his ashen skin, deep blue hair and white pupiless eyes. “C’mon Fred! We should get outta here. What if there’s another aftershock?” the dull skinned mutant said. Fred went over to the concrete pile and began inspecting the rubble. He stopped at a fairly large slab and motioned for Joe. The other mutant trudged over and the two bent down, put their clawed hands in position and on Fred’s order began to lift. Stone after stone was removed revealing more of Butch’s skeleton body. When the pair finished their task they backed off as Butch gingerly pushed himself to a sitting position. “Do you need any more help?” Fred asked. Butch pressed one foot down and then the other. At least nothing feels broken. Joe jogged off as Fred gave a nod and began walking away. Butch wasted no time in maneuvering himself to a crouch and through a spell of light headedness a wobbly stand. He allowed the feeling to completely pass before he looked up at what remained of the stands. A sense of dread washed over him as he saw that one of the support pillars had landed where his son, Bo had been sitting. No… Malone’s like a bullet! He got him out. Butch looked further up in the stands to the balcony of an office. There he saw a moss green figure being throttled by the gold tinted mutant. “I warned you, Zalgor!” the gold figure bellowed as he continued his attack. 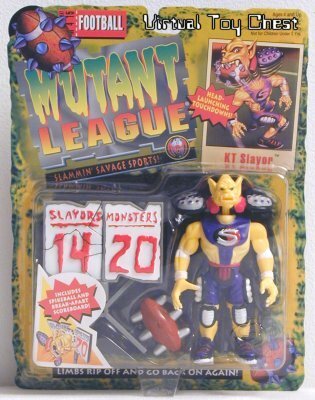 The stadium’s owner, Zalgor Prigg, finally manage to push the other mutant off of him. Then he balled his hand into a fist and hurled it into his opponent’s face. After seeing his attacker fall Zalgor stumbled back to be stopped by the balcony’s rail. With little thought to what the scene meant Butch began walking towards the players’ entrance. He failed to see that Prigg had turned around and spotted the lone figure on his broken field. As the mutant went on the dull aches in his body grew to throbbing pains. His breath became more labored and his legs felt as if they were on fire. He willed himself to continue on past the toppled goal post and into the shade of the tunnel. Butch fought to ignore everything and continue moving forward. He was finally halted when he felt something grip his arm and pull it behind him. Butch’s mind snapped to full attention as something poked his back accompanied by the unmistakable sound of a gun cocking. The skeletoid went quietly through the remains of the inner parts of the stadium to the office of its owner. The door stood already open revealing pieces of ceiling had broken lose and crashed on an undoubtedly expensive desk and carpeted floor. A television set and computer monitor lay smashed in front of the desk and standing calmly in the middle of it all was Zalgor Prigg. The top of Prigg’s head had grown to a tremendous size and on the uppermost part were two rows of stubby growths running down to a forehead of rounded ridges. What had been left of the business man’s black hair had become mutton chops the color of his olive skin. The unruly tufts nearly covered tiny spurs that flanking his prominent chin. A bulbous, hooked nose was the only unchanged part of this new look. “Why, Mr. Justice, what ever have you done with your skin?” he spoke as the goons brought Butch closer. Butch hid none of the distaste he held for his ‘host’ who calmly ignoring his guest’s scowl. “All I want to do is to find my son. I don’t care what crap you’ve screwed with this time.” Butch replied flatly. Prigg’s sky blue eyes narrowed and his mouth twisted into a snarl hinting at a set of fangs. He was quick to push his anger back and allow his fake smile and demeanor to return. Prigg’s mouth twisted into a sly grin as he watched the information register. Suddenly Butch felt the goons tighten their grips and the gun’s muzzle dig deeper into his backbone. It was then that he noticed that a red light had washed out his vision. Butch’s vision began to shift back to normal just in time to see his captor giving the kill sign to his goons. After that he could sense nothing. The latest awakening of Butch Justice was to an over powering flood of light. As reality became clearer he could feel he was lying on a cold smooth surface. Sitting up Butch began searching his recent memories leading to answers and frustration. As his mind began to blindly concentrate on the emotion it happened-- an intense red glow flooded his vision. He quickly allowed his vision to return to normal. Butch barely waited for his head to get used to standing back up as he scanned his surroundings. He quickly discovered there was someone else in this place. He walked over to see it was most likely the gold skinned mutant from the stadium. Upon this closer look his bald head appeared as if it had been painted with patterns of dark brown making him resemble a brain coral. Suddenly the other prisoner shot to his feet and looked fiercely at Butch. “Who the hell are you? !” he barked. I am a loving husband and father who happened to be in the wrong place at the wrong time. The mutant continued to wear a skeptical scowl. “I was the mayor of Los Angeles until today. I bet we’ll be declared dead when things get sorted out. In the end Prigg might just make it all official. Just call me ‘Hugh’ until then.” he rambled. Before Butch could reply everything began to shake violently. Both mutants failed to keep there balance as floor rolled underneath them and the lights flickered in response to the violence. Seconds seemed like minutes until the aftershock died down. Butch got back up and began looking over his surroundings again. It was a large cell with a wall of bars showing a hall and an identical cell outside. The floors and solid walls were a sickening white enhanced all too well by the bright lights. “We might be able to pry the bars apart.” Butch remarked. Hugh looked down at the dent he left. For a second he stared in total awe then got back to his feet. Butch turned and began walking towards the bars with Hugh not far behind. With near perfect timing both mutants took hold of one of the bars. Instantly they were filled with fury of a powerful electrical current. With all their strength and concentration Hugh and Butch kept their grip and pulled the metal. Further and further they could feel the bars moving. With each inch the pain became more difficult to ignore. When they finally forced their hands free it was unknown if they had done enough. Butch and Hugh felt their bodies encase in heat as their labored breath heaved air into their lungs. They slumped to the ground unable to notice that their blacked palms were touching the cool tiles. A deafening alarm was quick to tell the pair this was no time to recuperate. Through his haze Hugh watched as his fellow prisoner rose. Butch took a quick look at the hole in the bars then began to ease his way through the escape route. He showed little care when his bones grazed one of the bars. Before he was safely on other side the former mayor had forced himself to a stand. Hugh was completely out just in time to see the owners of the voices at the end of the hall. The security guards drew their nightsticks and charged forward. Hugh surged towards one of them using all his momentum and anger to tackle him. Butch ran to meet the second guard and grabbed his opponent’s weapon. The skeletoid forced his seared hand to tighten until the stick snapped. The guard dropped the remains of his first defense and drew his fist back. The battle was interrupted when a howl of pain sounded. “What did you do! ?” the injured guard bellowed. Butch and his opponent looked over to see Hugh had his arm shoved through the other guard’s midsection. The former mayor seemed more than happy to revel in his new found power. “Ha! Like it’ll be that easy.” Hugh proclaimed as he slipped his arm out of the sea of green blood and guts. “These chumps know they can’t just let us walk out of here.” He continued. “We’ve done enough damage.” Butch countered. “You were always a humanitarian, Justice.” Hugh replied as he moved over to the second guard and wrapped an arm around his neck. Butch looked sternly at Hugh. Butch slipped a walkie-talkie off the guard’s belt and handed it to him. “Any crap and I find out how fragile your neck is.” Hugh whispered. A strange sense of hope mixed with the unease as a new conversation began. Hugh rolled his eyes at the bad acting and thinly veiled double talk. Butch nodded telling Hugh he agreed with his pessimism. That was all Hugh needed to hear to turn his hostage around and walk him towards the elevator. The atmosphere in the elevator was deathly silent. All any of the passengers could do was steel themselves for the next obstacle. The friendly ‘ding’ telling passengers they’d reached their floor served as a signal for Butch and Hugh to take cover. Reese continued to cooperate as Hugh herded him out of the doorway. Butch peered around the side of the doorway to see a short grey aquatic themed mutant with his hands behind his back. The mutant’s small body was covered in a white lab coat. “That’s Doc Jukka, Prigg’s pet egghead.” Reese informed. Hugh face melted in total confusion. Hugh tightened his arm around his hostage’s neck. Butch’s eye sockets narrowed knowing it was more than likely too late to do any good. Still, the guard was moving after so much damage to his body. The skeletoid motioned for Hugh to follow as he made his way to the outside. With a growl Hugh followed. Jukka’s salmon colored eyes were genuinely shocked to see Butch walking before him. The scientist forced his mind to hold back question like “How can you be alive?” knowing there were no answers to be had now. Hugh barked out a “Fat chance!” before Butch could reply. The ichtioid brought his hands into view revealing one to be holding a remote control. The doctor then aimed the device at the floor and pressed a button. Pain receptors were instantly overloaded as they received the powerful stimulus. Two of the three mutants knew this feeling of untold volts releasing energy into their bodies. No body, mutant or man could withstand the assault for long. When Jukka saw his victims slump to the ground he activated a cage which sprang from the floor like a bear trap. He then transferred the power from the floor to the bars. Getting the prisoners back to a more permanent cage would have to wait until security got back from the round up. Through hazed eyes Butch watched the scientist walk over to the cage. When his mouth moved the skeletoid swore he heard “I’m sorry”. I just wanted to thank you for stopping by and checking out this page. I hope it brought back fond memories of the show. Feel free to pick up a copy of the book for your tablet. If you purchase the book on Amazon, you will be able to access it on any device that has a Kindle app. Take care and enjoy!